In a recent post I expressed my mystification at Sebastian Vettel's reputation; on reflection, it seems to be entirely the product of Michael Schumacher having picked him as a star of the future after watching him in a gokart race. Another rookie that seems a bit over-hyped to me is Adrian Sutil. Don't get me wrong - I think he is talented and he has already done sufficient in F1 to confirm this. But he seems to be given credit for outstanding performances when I can see nothing above the norm for new F1 drivers. To date he has done little but prove that he is quicker than Christijan Albers and several second tier drivers. So it is interesting that Force India have chosen to pair him with Giancarlo Fisichella. In Fizzy we have a known quantity that we can use as a measure of Sutil's abilities; and Sutil had better be quicker than the veteran pretty quickly or his reputation will soon suffer! The problem is that, so far, it isn't happening. At the Jerez test last week, Fizzy was the quickest Force India driver by far. 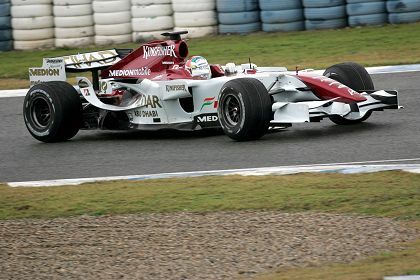 Fisichella managed a respectable time of 1:20.695, Liuzzi was almost a second slower at 1:21.553, and Sutil's best was 1:21.705. Even taking into account different fuel loads and weather conditions, that's quite a big difference. Remember, too, that this is the car that Sutil has been driving for almost a year. He should be pretty used to it by now, whereas Fizzy and Liuzzi were having to learn its characteristics from scratch. Suddenly the German doesn't seem quite the future star we thought. Part of the equation is that both Fizzy and Liuzzi have been under-rated of late, thanks to the poor machinery they have had to work with. They are actually a good deal better than last year's results imply and now they have a chance to redeem themselves. Put that with the fact that Sutil is a promising young rookie and no more, and it is understandable that he may find it difficult to outperform his team mates. And that is my point really - that Sutil has not earned his reputation as yet. I expect that he will turn out to be pretty good eventually but, at the moment, he shows some promise and that is all. If McLaren were genuinely interested in his services for the second car this year, they must have noticed something that slipped by me. i don't underrate fizzy, i just don't like him. we met him, he was miserable. he looks perpetually unhappy, and i wish he'd left the sport along with ralf. I'm chuckling at the irony of your words. Here we have a rookie who may in fact be over-hyped, paired with one of the most over-hyped drivers in history. I remember when Fisi was in his early stint with Jordan. There was a bar/eatery near my house that would show the races on a Sunday afternoon, and the owner considered himself to be a bit of an F1 expert. He rated Fisi quite highly, talking future champion and one of the greats. I scratched my head at this. Okay, I don't have the technical insight of a Peter Windsor, but I can see results and get the relative strengths and weaknesses of the various cars. We'll see, I told him. Looking back now, we hear the pundits saying, well he never had the car to prove himself or he never really lived up to his potential. Sorry, but he just didn't have it in him. He had the same car Alonso had, and he couldn't match the Champion. It may have been a matter of confidence, more than skill, but what is one without the other? Fisi's win in Brazil was by default, and he just never really managed to pull it out and pour it on. Don't get me wrong, he seems to be a likeable guy and in today's age of polished responses, I think he often speaks his truth instead of corporate sound-bites, but at the end of the day, which for him is fast approaching, he just isn't one of the greats. We'll see if Sutil and Vessel fall into the same category or have that something extra that takes them to the next level. Maybe my problem is that I remember how good Fizzy was when he first arrived in F1. In my humble opinion, the Flav ruined him by putting him in a series of uncompetitive teams and that seems to have knocked the stuffing out of him (it didn't help that he was teamed with Alonso for a couple of years, too). Like both of you, I thought he was down and out (although still better than he was being given credit for) and then he puts in times like those at the Jerez test. Who knows? There might be life in the old dog yet. Now I rate and like Fisi. He's no Alonso or Raikkonen, but the guys had a long career, sorry, having a long career, has won races and seems perfectly pleasant and talkative. I also rate Sutil, but as Clive says, I also think he's a bit over rated at the moment. He did well in his first season, especially when you consider everything that the team was going through in the background (being sold, once again). I don't think he deserved to be considered for McLaren, but I was enjoying the fact that he may have been given the drive. Now that would have been fun to watch. I do think Vettel is quite special. Karting is where you really get to see skill behind the wheel. There's a famous video on YouTube of Prost and Senna racing in the early '90s around a kart track somewhere that makes for fantastic viewing. You're right though Clive, Sutil will have really prove himself this year. He was on multi-season contract at Spyker, but I'm not sure how that has transferred over to Force India. And with Liuzzi and Klien all desperate to get back in F1, added to the many other young hopefuls looking for a break, Sutil needs to beat Fisi in 2008. Although I can't see it happening myself. I think Fisi is about to pull a Coulthard and show there's still life in the old dog yet. One thing about Fisichella fans is that they're loyal to the death! My younger son started watching F1 just as Fizzy arrived and was most impressed by him - he still hopes that he'll make the big breakthrough. And, of the old stagers, he is still the one most likely to surprise. DC is solid and reliable but past his best, I think, Barrichello has had all the stuffing Schumachered out of him, and that leaves Fizzy. I know it's unlikely but I'd kinda like to see him put Sutil in his place this year. I agree that karting is the place to see precocious young talent. But they don't all make it. Sometimes the transition to F1 is a formula too far. Liuzzi thrashed Mickey the Shoe in a couple of kart races a few years ago - look at him now. "But I note that neither of you can put me out of my misery by explaining why Sutil is so highly rated." ok. monaco. practice in the wet. first. fluke? maybe, but if you rate drivers by how good they are in the rain and you consider it was monaco, plus he was in a spyker, that's something for sure. Hamilton hypes Sutil up as well (they are close friends off the track) and I think that is where a lot of the speculation comes from. As for Fisi, I have always been a fan. Someone - I think on here - summed it up the best saying he is a great driver of not so good cars and a not so good driver of the great ones. Perhaps having to battle all those years in uncompetitive cars ,as you say, knocked the stuffing out of him. He isn't the first person we had high hopes of, only to be disappointed. For my money, I had the biggest hopes riding on Montoya and look where that got me ! Sutils record before F1 is a mixed bag, with nothing to really show that he is a front-runner. He was runner up to Hamilton in F3, but that seems to be his best. Truth be told, I think he owes his job to Colin Kolles. Period. As for Fisi, I agree he has the talent, but he's not a complete driver, and you're probably right about Flabio. Fisi was between a rock and a hard place. Fire Briatore and he wouldn't have a seat in a Renault. Stick with him and he decides your future. If he can translate his testing times into racing performance, it will be great fun to watch him play in the mid-field. As for Montoya, I agree that he was a disappointment in the end. I really wanted him to be good enough to beat the Shoe but I think it was a lack of discipline that let him down. One of those with so much talent that he didn't think he had to work for it. "hauled the Toro Rosso into ninth place"
see, if we're on the subject of hauling toro rosso's anywhere, how about vettel bringing that same car home to a fourth place finish in china? don't tell me that was a fluke because he almost went one better a week earlier, had it not been for the lunatic leading the pack. Good point, Arnet - once Fizzy was contracted to Flavio, he didn't have much option but to stay with him. Both wet races, Sidey - and the TR proved a handy toy when it rained. Look at Liuzzi's times in the same races and you'll find that he was quicker but had the wrong pit strategy. Judging from the comparative wet race abilities of Speed and Liuzzi, Scott would have been at least third in China under the same circumstances. "Scott would have been at least third in China"
your faith in the man is a little unnerving, but clearly we'll just never know. i think the right decision was made at str and the rightly or wrongly the team appear better off for it. I agree that the right decision was made, Sidey - clearly the team was unhappy even before the season started. But it is wrong to blame Scott for that, as most people do. Tost and Berger didn't want him and made that clear; his ultimate dismissal had nothing to do with his performance, it was a personality clash. No doubt my faith in him is unnerving, just as Christine's is in Franck. ;) But I base that faith in having studied Scott's times and results while he was at STR. He learned and improved constantly and was consistently quicker than Liuzzi several races before STR got rid of him. The likelihood is that he would have continued to get better, given the chance. Yes, as one of my drunken college roomates said so many years ago "irony can be so ironic". Good post, Uppili, and the nearest thing to a trackback this blog will do as yet! One day, when Mad gets around to it. As for Scott Speed, I really think he suffered from anti-American discrimination. Berger never would have taken him without Mateschits's Red Bull backing. Dietrich is far more "international" than Gerhard ever will be, and I will point out that as a half-Austrian, I can assure you that they are the most arrogant nation in Europe. Berger's attitude that Speed is just a pissant wannabee certainly wouldn't have been helped by Speed's own arrogance, they simply clashed egos. So Speeds improving style and pace just couldn't overcome the difference/similarities in personalities. Excellent post Uppili. In the USA our football draft gets the same type of comments about quaterbacks (the most important job on the team) we all know that the player has to prove to be great. And if you picked it you are a genious if you don't your an idiot. I think we tend to assume that driving ability is the same as the ability to deliver results. It is not. Lewis Hamilton is simply assessing Sutil in other formulae and is commenting purely on driving ability. To the best of my knowledge he has not discussed Sutil's ability to improve a car or work with a team. There is a history of drivers showing exceptional talent and ability in lower formulae only to fail in F1. Jan Magnussen being the most spectacluar example. On the other hand there are drivers like Mansell who was anything but special in F3 but thrived in F1 to the extent that he won over 30 races. Magnussen didn't lose his ability to drive and Mansell didn't learn to drive in F1. I think Fisichella is generally over-rated. Like Coulthard and Button he would have had better results had he raced in the 70s when wheel to wheel racing was more prevalent and the classical driving style more profitable. I think to a degree it is unfair to compare him with Alonso because Alonso has an odd driving style which only Kubica shares and when Renault changed there design direction to suit his driving style Fisichella was at an unfair disadvantage. Obviously Renault set up to suit Alonso because he was the better driver but the gap between the two was exacerbated because Giancarlo had to drive a car which did not behave as he would have liked as it was set up to accomodate Fernando's driving. Fisichella won first time out for Renault and then had a run of bad luck that put him well behind Alonso in the championship. From that time onwards, the team catered to Alonso's needs and Giancarlo had to accept what he was given (which he did without complaint). So he may well be a lot better than he appeared to be in 2005 and 2006. I think there is much truth in what you say, Steven - Fizzy was not a world beater as it turned out but he is certainly a competent and honest driver who will be a great asset to the Force India team. It goes without saying that I fit Clive's "loyal to the death" category, but that's because the determination, good character and smooth driving style that attracted me to him are still there. It may have taken me until Monaco 2001 to start supporting him, but once I decide to support a driver, it tends to be non-negotiable provided the original reasons for my support remain. I can see why Sutil has the reputation he's got. He's been much faster than his opponents and has some eye-catching performances (Monaco's wet Saturday practice, Spa) to his credit. However, he is up against second-year syndrome (where a rookie usually does worse in their second year than their first - reasons unclear). The other two rookies of 2007 don't have this problem because they've teamed up with each other. Sutil, on the other hand, not only has to worry about being up against a team-mate that will probably defeat him (not only because Fisi's naturally very fast, but because he's something of a low-ranking-team specialist). Speed didn't lose out due to anti-American discrimination. Given Toro Rosso's management of the team so far and especially their tendency to blame Liuzzi and Speed for their own faults, I'd suggest they are equal-opportunities idiots. The Sebastiaens may find this out to their cost. This post and the one on Max, which I will gleefully contribute to, are why I'm really enjoying your posts. Hanging out with folks that know more about a subject than I is quite enlightening and sometimes humbling. Back in the day, when he and the Shoe were driving together pre F1, the word was that Harry Heinz was just as good as Schumi. Here's my point: having the driving talent just isn't enough. Mental toughness and confidence are vital and the ability to learn and adapt is something that most drivers don't take into consideration. Matt Bishop brought this up in F1 Racing. Drivers don't have coaches, so who helps them learn. LH had a sports neurologist to work with, and I would guess it didn't harm him any. Losing his wife to his rival probably had an effect on HHHF's confidence and Fisichela always was a more sensitive type, which in terms of driver personalities, I much prefer over the verbal efficiency of Kimi, but if you lose your mental ground,it doesn't matter how much talent you have in the bag. Now I would argue that Fisi may drive even better in the Force India car, because he will have the underdog's fight in him, instead of underperforming in a top team. Yes, I'm pretty disappointed in Berger's management style. I really liked him as a driver, rooted for him whichever team he was in, but he seems to be a bit of a crybaby now, as do his former drivers. I doubt whether he has what it takes to really succeed. A team leader needs to inspire, and it's too bad that Bourdais will get his first, and perhaps only drive in F1. I think you're right about Fisichella and Frentzen, Arnet - to be summed up by reflecting that nice guys don't win. Berger was one of my favorite drivers when he was teamed with Senna but he certainly made a pig's ear out of managing his drivers last year. Just one quibble I have: Scott Speed was no crybaby. Anyone who continues to race in spite of suffering from an incurable and degenerative disease such as ulcerative colitis (and does so without complaint) is no crybaby. Bourdais has one advantage that might enable him to succeed in STR. Berger likes him. Always interesting to see how our perception changes over time, Alianora. It's true that Berger nearly gave up on Bourdais mid-season (he doesn't give drivers much of a chance to prove themselves, does he?) but the Frenchman is suddenly looking a lot better and beating Vettel on occasion. I think if Bourdais can continue his run of form to the end of the season, he will have guaranteed his seat for next year. And then we can see what he's really made of, with a year's experience under his belt.